Tube feeders are one of the most common ways to feed birds. Easy to fill, durable, and versatile. Most brands offer warranties against squirrel damage and supply parts so you can keep your feeder going for years to come. We stock many brands and styles of tube feeders and are always happy to special order anything that we do not have in stock. Black oil sunflower or a sunflower heavy blend is the most popular seed to use in a tube feeder. Aspects quick clean tube is one of our favorites. Easily remove the base of the tube without tools for easy cleaning. The Aspects quick clean tube has attachments such as a seed tray and weather guard to keep rain off your feeder and catch seed. Aspects big foot tube is a high capacity option. 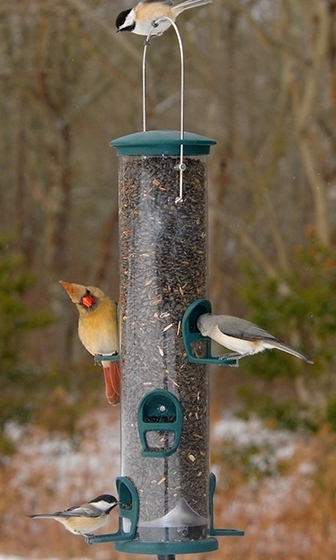 This feeder holds 3.5 quarts and has wider perches and ports for to encourage larger birds. This feeder also has a quick clean base. Aspects tube feeders are a quality made in America product. All Aspects tubes offer the quick clean base which make cleaning out the bottom of your feeder super easy. With optional seed trays, baffles and weather guards one can customize a feeder to achieve the desired results. And with a life-time warranty against squirrel damage these feeders will serve you and your birds well for many years. Droll Yankees CJ 4 port feeder. 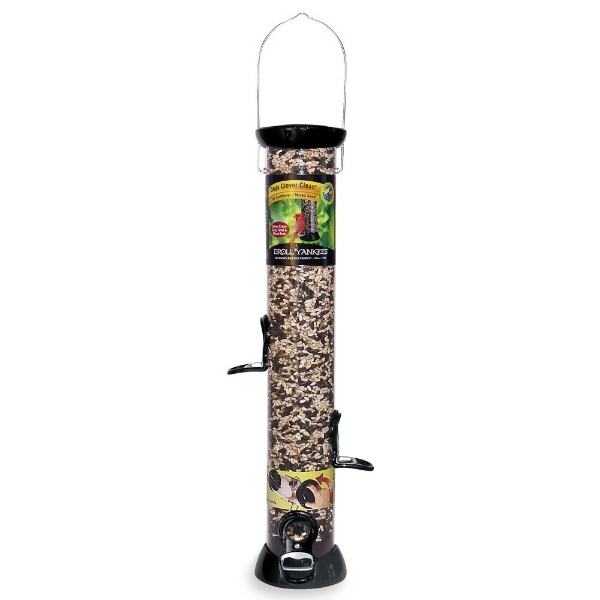 Droll Yankees has been a staple in bird feeding since 1969 and was one of the first to come out with the tube feeder design. 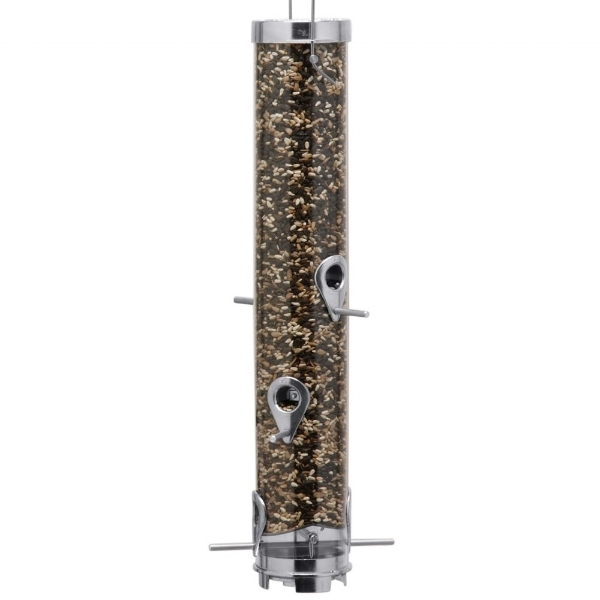 We carry many Droll Yankees feeders in a variety of sizes and types ranging from sunflower and nyjer feeders to squirrel proof and caged feeders. Accessories such as trays, baffles, and weather guards are also available to fit all styles of Droll Yankees feeders.